« How to Make it a Summer of Kindness with your Kids! Disclosure: This post about the Kindness Elves tradition contains affiliate links that support Me Plus 3 Today at no additional cost to you. Special thanks to The Kindness Elves for providing us the wonderful accessories pack and elf set. All opinions are my own. “I want! I want! I want!” How many of you hear this over and over again from your kids, especially around the holiday season? All of those marketing experts out there are doing a great job, because my kids have definitely started to pick up on this. From toy catalogs coming in the mail, commercials on the TV, and even the toy aisle at the store, kiddos are definitely bombarded with a lot of cool stuff that they think they want! I’m trying to teach my kids the difference between wants and needs, while also teaching them that just because they want something, it doesn’t mean they can have it. If you’ve read some of my other blog posts, you know that instilling the values of kindness, empathy, compassion, and gratitude in my kids is a big deal to me. Not just around the holidays, but all year long. If that sounds like something you would like to do too, then you came to the right place! Over the past few years, one way that I have been teaching my kids kindness and gratitude is with the awesome holiday tradition of The Kindness Elves! You may have heard of the Elf on the Shelf, but The Kindness Elves are something completely different. Don’t get me wrong, the antics of the Elf on the Shelf can be pretty funny, but I just love how The Kindness Elves turn a common holiday tradition into a fun way to instill important values in kids. 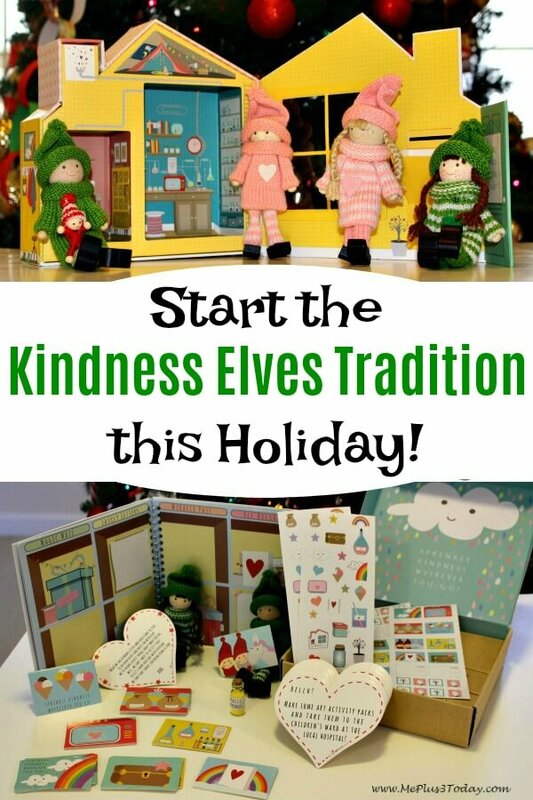 The Kindness Elves tradition is such a magical way to encourage kindness in kids during the holidays. 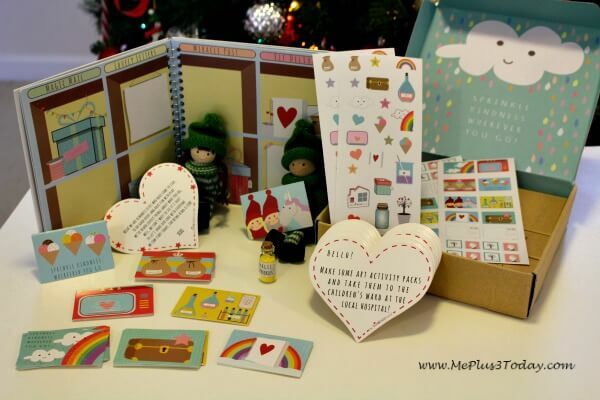 The Kindness Elves arrive around December 1st and leave on Christmas Eve. When the kids wake up each morning, the elves are waiting on the kitchen table. They have a note with an idea how the kids can spread kindness that day. Sometimes the act of kindness has to stretch a couple days, especially if it involves making something and delivering it. Obviously the holidays are a busy time for everyone. 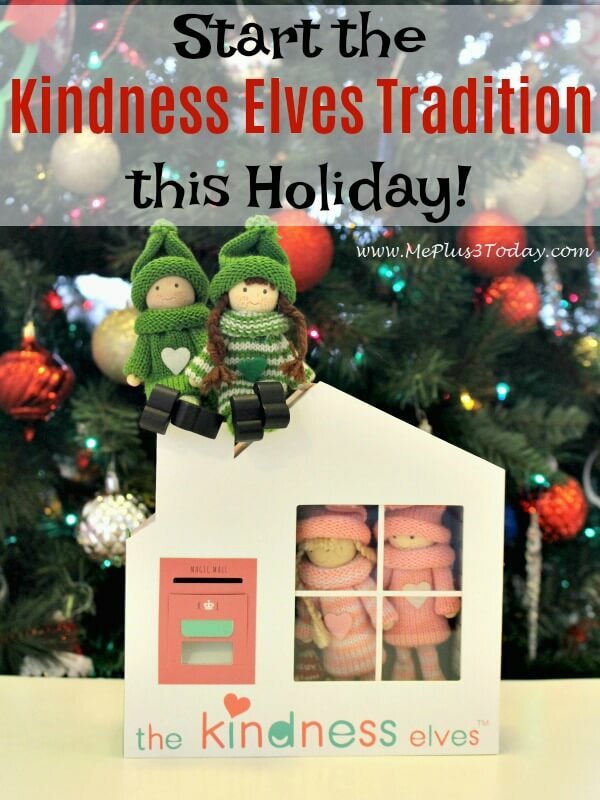 So you can accomodate the Kindness Elves tradition to however it works in your family! The kids are always so excited the see The Kindess Elves with a new note each morning! I have to read it to them first thing before they can even eat breakfast. After everyone understand our act of kindness for the day, The Kindness Elves go back to their house on our fireplace mantel. Our Kindness Elves don’t hide anywhere or need to move to a different spot each day. The Kindness Elves have definitely been one of our family’s favorite holiday traditions. 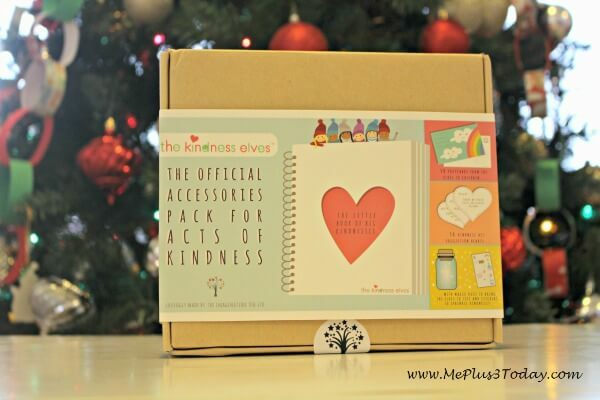 As a single mom who always has a lot on her mind, I am particularly a big fan of the products from The Kindness Elves because they make it so EASY! Because let’s face it, the holidays can be a pretty hectic time for parents. First, The Kindness Elves themselves come in these adorable little houses with a tiny mailbox for the kids to “send” them letters. Better yet, The Kindess Elves are available in 4 different skin color combinations and have 6 different clothing colors options. They each come with their own name and have special jobs. 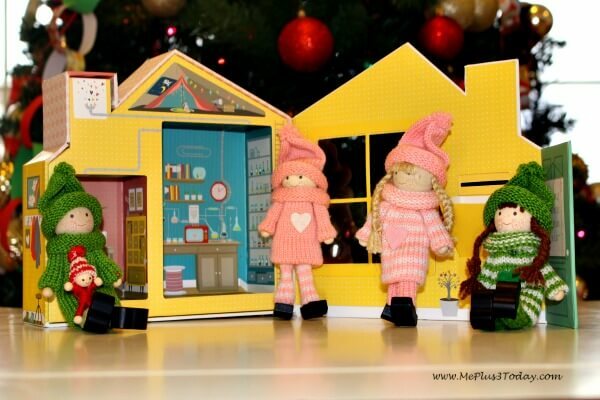 You can meet and get details about the entire Kindness Elves family here! Next, The Kindness Elves have this awesome Accessories Pack available. It includes everything the elves need to bring their magic to life. With 40 Acts of Kindness cards already written out on cute little hearts (plus 10 blank cards), you won’t have to spend time scouring the internet for ideas and scrambling to print or write something out each night. There are even more cute items in the Accessories Pack that make the Kindness Elves tradition extra special. For example, tiny postcards for the elves to thank the kids for their good deed. It can be really fun to leave them somewhere for the kids to discover. The Little Book of Big Kindness is a great way to keep track of the fun. Of course the kids will also love the stickers and a tiny bottle of magic sprinkles included in the pack. But the best part about The Kindness Elves is that they can be use ALL YEAR LONG! 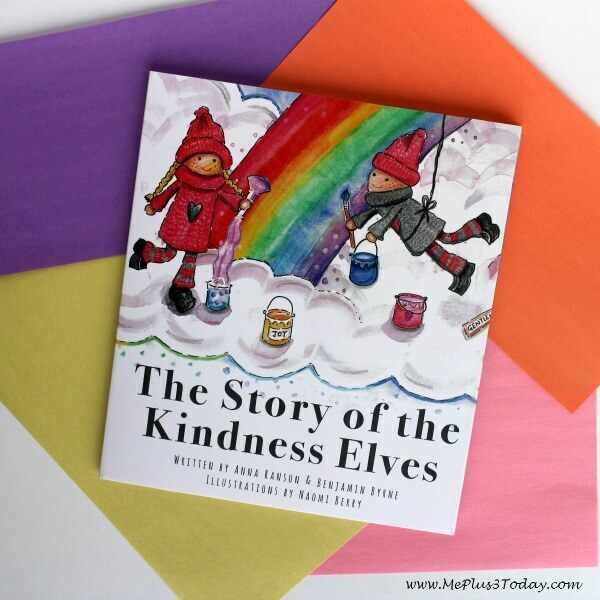 With color options like pink, purple, grey, and blue, your Kindness Elves don’t have the look “Christmasy.” And in the book, “The Story of the Kindess Elves,” you will learn that the elves aren’t just for the holiday season. I wrote more about this awesome book here. Ultimately, The Kindness Elves is a great holiday tradition to invest in! Whether you choose to use your Kindness Elves on special days or weeks throughout the year, or just at Christmas time, The Kindness Elves tradition is one that your kids will never forget! Plus it will also be teaching them important values that will benefit them their entire life! Learn more about The Kindess Elves by visiting their website here. Leave a comment and let me know which clothing and color combination you would choose! If you liked this post, then Pin It! Tagged Acts of Kindness, Affiliates, Christmas, Christmas Traditions, Gift Ideas, Holiday Traditions, Holidays, Kindergarteners, Motherhood, Preschoolers, Service Project, Single Mom, Sponsored, Teach Kids Kindness, The Kindness Elves, Tips & Tricks, Toddlers, Twins. Bookmark the permalink.